You are here: Home » Would Someone Open a Leslieville Brewery Here Already? Leslieville sits along along a long strip of Queen Street East that is ripe with restaurants, bakeries and shops but devoid of a local brewery, or even an LCBO for that matter. No it doesn’t have the density of the west end but its a well established community unto its own and the 2km walk up to Danforth leaves too much separation to the brewpubs arriving in that neighbourhood. And then there’s 1001 Pape Avenue, an auto service centre sitting at the corner of Paper and Queen. 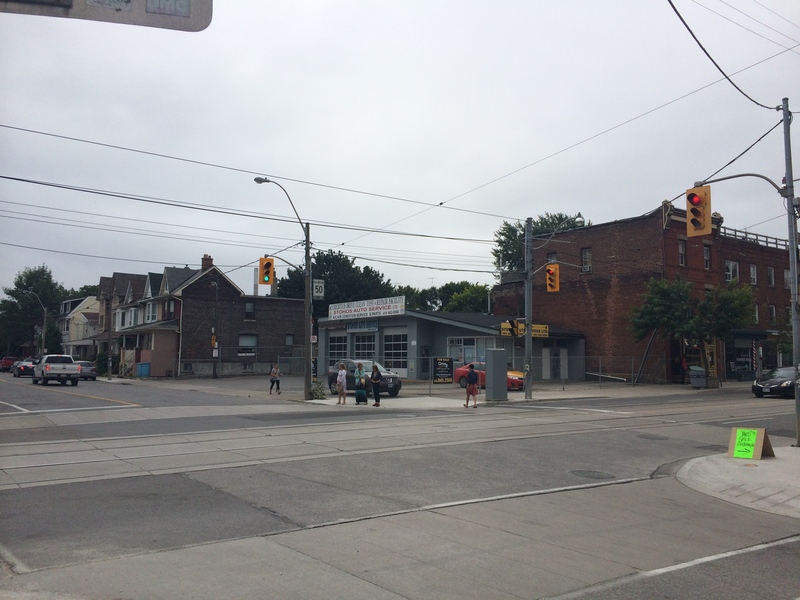 Its prime Leslieville and short walk from the developing condo strip along Carlaw between Queen and Dundas. With three garage doors and generous wrap around parking, it doesn’t take much imagination to see what the right amount of money could do to turn this into an incredible brewery and patio destination – the “Bellwoods of the East”, only bigger. Sure, breweries may be reaching critical mass in Toronto as a whole, but I don’t think the distribution is properly balanced, certainly not in favour of this area. Alas, I don’t have the capital to pursue this myself, but isn’t there someone with some money that sees what I see? There already is a Leslieville brewery 🙂 Leftfield, and their Saison is lovely! I agree though, Danforth and Greenwood isn’t really Leslieville, but its close! Yes, I’m aware of Leftfield’s location and agree its a solid option, but still leaves a complete vacuum on Queen east. This has inspired me, I’ve yet to visit the location and I live only a few blocks away!